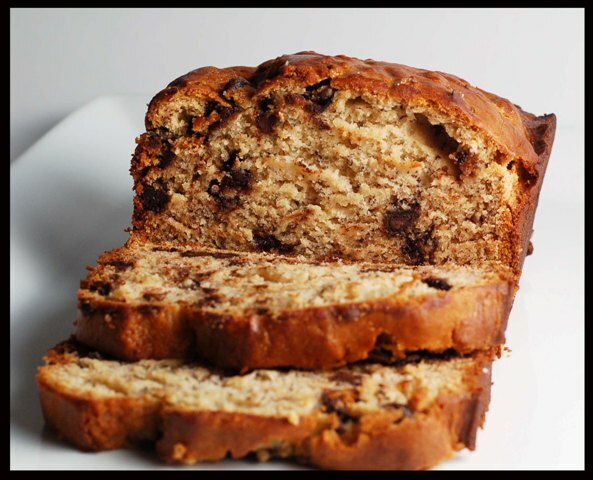 A few months ago I made a Tuesdays with Dorie Banana Bread, while it was very good, it was not as good as my friend Evelyn’s Ultimate Banana Bread with Chocolate Chips. I have received a few requests for this recipe so I decided now was the time to share the secret! The addition of cream cheese and sour cream make this bread ultra moist. The chocolate chips, well, you just cannot go wrong with chocolate! This bread makes a wonderful weekend breakfast when served with coffee and fruit. As well it is great as a light dessert or snack. Heat oven to 350. Lightly grease a loaf pan and dust with flour. Cream butter, cream cheese and sugar until light and fluffy. Add the bananas, egg and sour cream and mix until smooth. Add dry ingredients. Stir in chips. Pour into prepared loaf pan. Bake for 60 – 75 minutes, until golden and not doughy in the middle. 12 Responses to "Ultimate Banana Bread with Chocolate Chips"
Yummy. I'm not a huge fan of chocolate for Breakfast so I think I'll substitute raisins for the chocolate chips. Looks delicious! This bread looks nice and rich! Banana bread can do no wrong. Especially when it has chocolate in it. What a beautiful bread! I love the rustic-looking crust. I just baked this banana bread. I fell across the recipe quite by accident when searching different recipe sites (foodgawker). At random I chose this one...and SOOOO glad I did. This banana bread lives up to its name; it is the BEST banana bread i've EVER tasted; sorry mom!! :) Bake some..NOW!